In order to validate P system models and to assist on their formal verification, simulators are indispensable. Moreover, having efficient simulation tools is crucial, and for this purpose, parallel platforms should be employed. So far, several parallel simulators for P systems have been developed, specifically targeting GPUs (Graphics Processing Units). 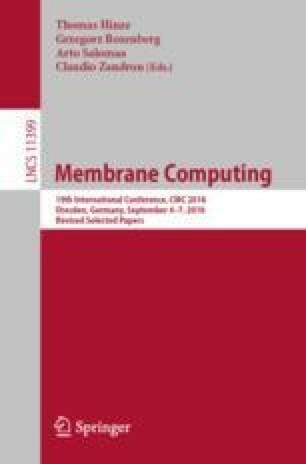 Although being a hot topic within Membrane Computing, mapping P system parallelism on GPUs is still not a mature area. In the past, we have successfully accelerated the simulation of two specific families of P systems solving SAT with GPUs, and learned in the process some semantics ingredients that fit well on these parallel devices. We are extending this exploration by designing an specific simulator of a P system model for the FACTORIZATION problem. In this paper, we analyse the two main approaches for simulators, and depict some design decisions required for this case study. The authors acknowledge the support from the research project MABICAP TIN2017-89842-P, cofinanced by “Ministerio de Economa, Industria y Competitividad” (MINECO) of Spain, through the “Agencia Estatal de Investigacin” (AEI), and by “Fondo Europeo de Desarrollo Regional” (FEDER) of the European Union.